Because they didn’t have any of this car closer than that? Also, I think I got a very good deal on it. I’d seen an almost identical car to this one get bought in SoCal for $23,900 (by “seen”, I mean that I bid $23,500 for it, the guy “accepted” my offer, then 12 hours later said that he had also accepted a better offer and that that person had come and paid for the car already). 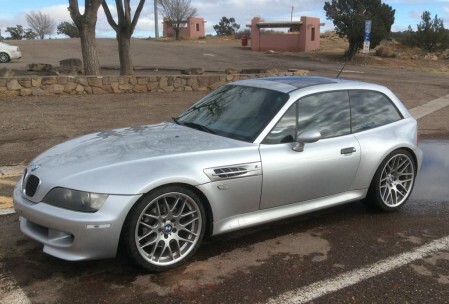 I guess I also saw the sales price on that one M Coupe site. 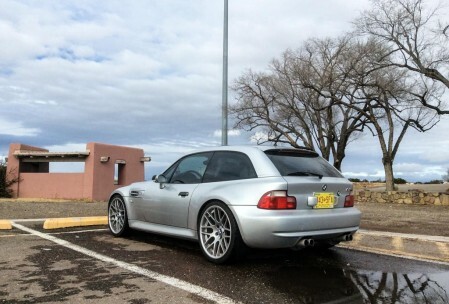 Found the car on that one M Coupe site (which was super-helpful, thank you whoever you are who runs it). Made an offer, got the offer accepted, just that the car was in Albuquerque and site-unseen. Bought a one-way ticket on Southwest from OKC to ABQ, changing planes in Houston. It literally would have been faster to drive there, except then I would have had two cars to drive home. Car drove great as far as I could tell and had no problems, so transaction was transacted. Somewhere between Albuquerque and OKC I stopped at a rest stop and took these photos. 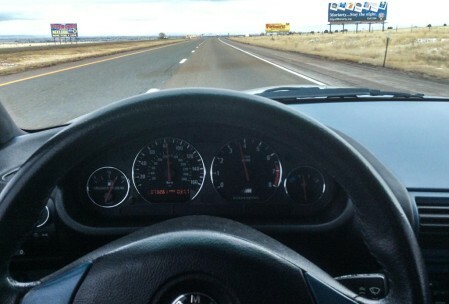 It’s a 2000 BMW M Coupe. They only sold like 3,000 of them in the US over the five years of production (and another 3,000 or so elsewhere in the world). It’s kind of weird to see my car in the parking lot and say, hey, that’s my car. Weird, not interesting. It snowed on the way home. It’s not a great snow car. It didn’t snow very long. This all happened in February. Of 2015. The guy with the M Coupe website said that whoever bought this car at that price got a very good deal. #validation, etc.